Today on the Yarnthing podcast with Marly Bird: Knitting Lace Expert Brooke Nico! Brooke Nico learned to sew when she was little (another person who doesn’t fit into the fashion industry mold and needed to make her own clothes). She kept sewing through college and having kids until she had to give up her sewing studio when she became a stay-at-home mom. In desperation for something to do, she ran out one day, bought Knitting for Dummies and a skein of yarn, and taught herself to knit. As Brooke was not one to make scarves or washcloths, her first project was an intarsia sweater for her young son. After that first project, she decided to make her own patterns and hasn’t looked back since. A few years after learning to knit, she became co-owner of a yarn shop, Kirkwood Knittery, in St. Louis, MO with one of her former students, Robin Schrager. Brooke attended a SoHo publishing shop owners meeting and was noticed for the sweater she was wearing. They asked her if she wanted to publish it and that’s how she got into publishing her designs. Brooks niche in the design world is lace garments. The intricacies and challenge with lace really inspires her. She really tries to work garment shaping into the lace patterns. Brooke has been published in Vogue Knitting, Knitters magazine, and Debbie Bliss magazine. 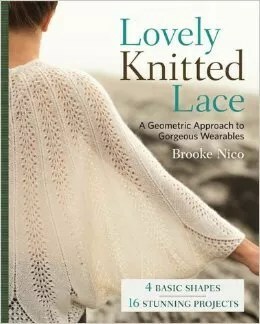 Her newest publication is a book, Lovely Knitted Lace: A Geometric Approach to Gorgeous Wearables. Each section of the book is based on a specific shape. Each shape is then explored to make several different garments that can be made with different shaping or seaming. The pieces are made to have a great feel and drape with great yarns, Brooke takes great care to swatch and choose the perfect yarn and gauge. The book is not quite out yet, but keep an eye out for it soon! You can find Brooke on: her yarn shop’s website KirkwoodKittery.com and Ravelry. Brooke also attends the various yarn events like Stitches and VK Live. Listen in below to hear all about Brooke and her shop and her book! And the Giveaway! As always, leave a comment below with Brooke’s keyword for your chance to win a copy of her new book! Lace knitting is gorgeous. It reminds me of different shapes and designs that I studied in my geometry class way back in high school. Great show. Thanks for putting it on. Brooke’s keyword is geometry. I loved studying geometry in school so many years ago. Just wanted to say I really enjoy your podcasts now that I found them! And you don’t need to apologize for “being all over the place” with your topics as it all falls under the main umbrella of yarn and what creative things we do with it. It’s really fun listening in, just like a telephone conversation with a best friend! Thank you for what you’re doing, Marly! And although math may get scary for some people when it comes to needlework, geometry is the beauty that brings all the dimensions in together which makes the math enjoyable and even intriguing. As a retired math teacher I love the components that math and geometry play in knitting and crochet. This was such a fun podcast to listen too. It would be a huge thrill to win Brooke’s book. In high school the only classes I truly enjoyed were physics and geometry. Nowadays I find that the patterns I am immediately drawn to are the ones with geometric patterns, they just make the most sense and are more logical to me. That’s probably why I’ve dove head first into the Great Hexipuff Challenge on Ravelry. I love the geometry found in lace patterns. Brook’s garments are unusually beautiful and cannot wait to see her new book. Having become a knitter in the last twelve years, I have gained a new appreciation for geometry and math in general that I never had before. My relationship with numbers was sketchy at best until I realized how pattern, order and logic (not to mention great yarn!) can create beautiful, inspiring results. Brooke’s new book looks like it will be an incredible combination of all these things. What a relief to hear that I’m not alone in being attracted to lace because of geometry! Thanks for the opportunity to hear from Brooke herself, and to find out more about the upcoming book. I can tell I will enjoy it. I hope I win! I loved geometry in high school, and now I can appreciate it in my lace knitting. My fave things to knit are lace shawls and socks. I am a math buff and totally love geometry! Can’t wait to try some of the patterns in Brooke’s new book. Take care and keep smilin! Thanks for another great show. Honestly I never liked math of any type (geometry, calculus, trig) but I see now how much I use it and can appreciate it now! Can’t wait to check out Brooke’s book! I have never been great at geometry, but I recently finished crocheting a doily sweater vest, and it turned out great in spite of my lack of skill in that area! I would love to learn more about lace! Geometry … oh that brings back nightmares…. I have never been a big math person I am more of a science and literature girl. I loved the show and learned a lot. Brooke Nico has some awesome designs and look like a geometric art in away. I love lace knitting and I just finished my first lace shawl. I am an engineer and I understand the importance of geometry in design. Brooke Nico’s designs are exquisite! Great interview with lots of giggles. It reminded me of studying geometry at school, which I enjoyed more than algebra! Love the geometry of lace. A great interview! I love when others figure out the geometry and math required to whip up beautiful designs – and I can just follow directions and get a stunning piece as a result!! I kept on admiring Brooke’s designs during the interview… what beautiful, intricate and totally wearable designs! Geometry was my favorite subject in high school! It would be fun to use those skills knitting lace with Brooke’s book. This podcast is uncannily timely. I am starting to design lace shawls and accessories and learning everything I can. Brooke Nico’s book is ideal for exploring different geometries! Working the lace pattern so the yarn overs are part of the shaping is such a great idea. I love the idea of a set of knitting patterns based on geometry and how they can work with a garment. If only geometry were taught in school using knitting and crochet projects! Wouldn’t that be fun?!! Thanks for the great podcast, Marly! I love the geometry used in yarn crafting!! Awesome podcast! Another great podcast to listen to! I am totally enthralled about using geometry and math to try to figure out a lace shawl. Can’t wait to give it try! Loved the podcast. The geometry of lace is what I love! I hated geometry in high school – all we did the entire year was prove theorems step by step by tedious step; every single one ever done in the geometry subset of math, over & over. never saw the point – formulas yes, proving them, no. that year never helped me in any of my advance math classes either.